We spent 3 years and 10,000 hours creating this intelligent and hugely entertaining game for your Android device and best of all it's free! Planning a nostalgic Retro Pub Quiz Night? Then this is most definitely for you. 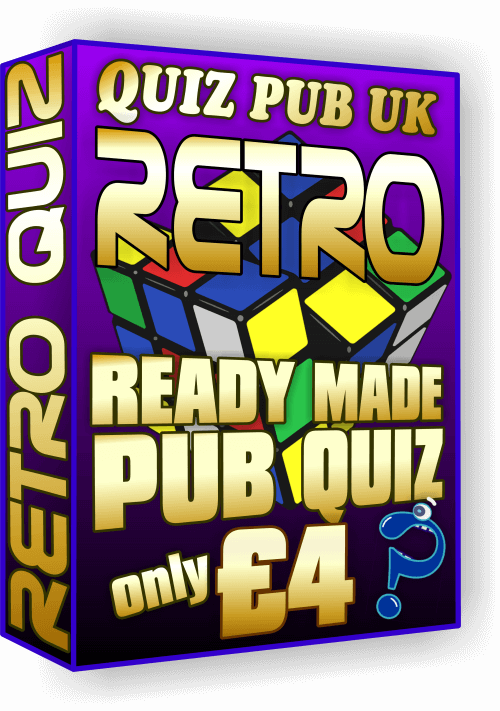 It took days making this Retro Quiz to give your quiz teams the most memorable and nostalgic quiz night ever, it really is top notch and every round is easy and fun to play. This quiz pack has 5 rounds! Including an audio bits and pieces music round (Disco Party Music) and a 10 picture handout round of retro toys, 10 music questions round, Retro Million Pound Drop and easy 70's & 80's general knowledge. Included in the quiz is a retro tie breaker question too. Wait, that's not all! There is also a bonus 3 minute speed round designed just for this quiz for you to handout making this one of the most fun quizzes you'll have ever hosted. Download this quiz now! This Quiz night will definitely get you a big round of applause and we get emails all the time from satisfied quiz masters who say that this has happened to them. 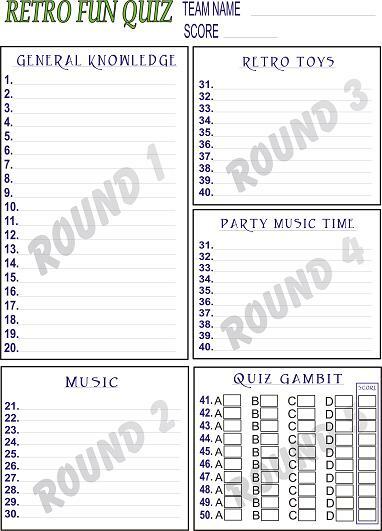 Here's the quiz team answer sheet taken from this quiz pack. It's very important to us that you are satisfied with our products and our service. If this is your first quiz from us then we strongly urge you to look at our help page before you download any of our pub quiz packs. 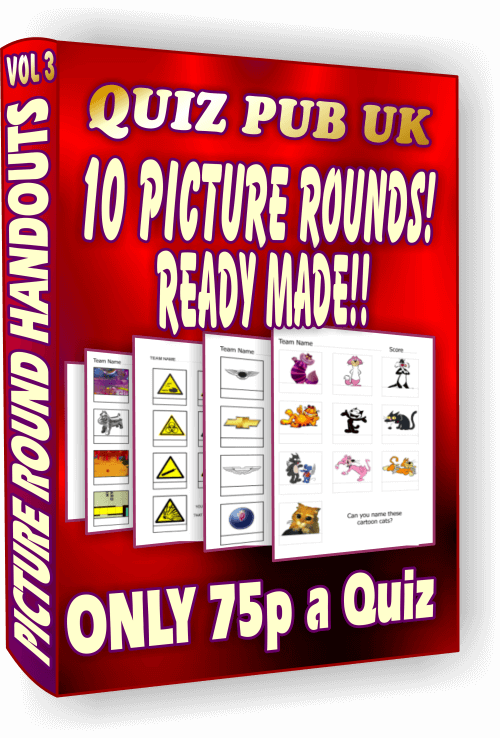 Ready made Pub Quizzes don't get any better than this and if you need convincing then keep reading past the quiz pack below for more information. 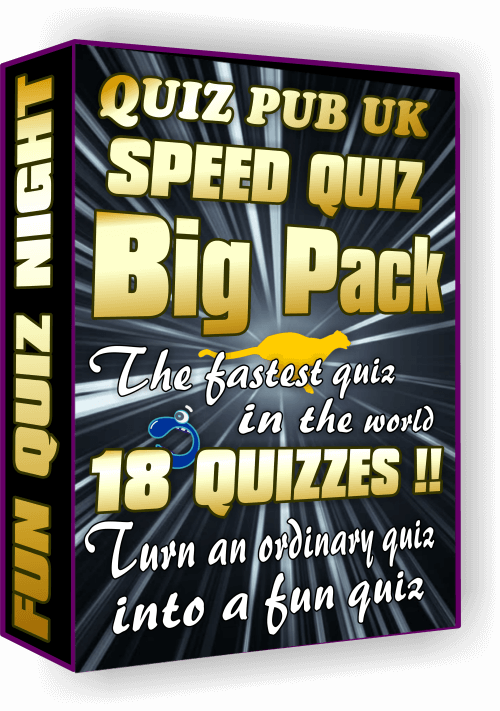 Why pay for these quiz packs? There's a lot inside them for the tiny price tag for starters. Can you make a quiz with an MP3 music round or a beautifully made retro toys picture handout designed on professional drawing software? Have you ever made a really fun speed round that your quiz teams will tell you they really enjoyed playing? Would you know how to make a really fun quiz round based on the TV show 'The Million Pound Drop'? Most people would answer no to all of those questions and that's what we're here for, to do all the hard work for you and best of all we don't ask much for our time and effort. To help you decide here are a few of the questions from this quiz pack and one of the pictures too. On TV, what was Lovejoy's occupation? Mods were well known for wearing which type of jackets? What was the name of the first ARCADE game (not computer game) released in 1976? Who was a founder of the Guinness Book of Records and always appeared on Record Breakers? One of the 10 pictures from this retro quiz pack. We remove the backgrounds from all our pictures which makes them more attractive and easy to see in dimly lit rooms, best of all it will save you a lot of printer ink. We make all our own material so you know you're doing a quiz that no one has ever done before. We also don't put our logo or name on any of the sheets you hand out to the quiz teams so they will look like you made them. Let these tried and tested fun quizzes make you look like a superstar quiz master and all for the price of a pint, go on, you know you want it. 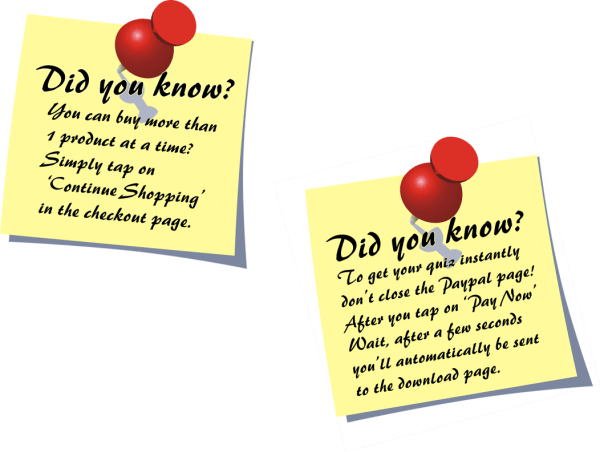 If you want to try one of our pub quizzes before you buy one then please tap on the button below to have a look. These ready made pub quizzes cover all the major occasions throughout the year. Christmas, Valentines Day, Saint Patrick's Day, Saint Georges Day, Halloween and many more. Taken from the popular TV show these questions and answers are a great addition to any quiz night. 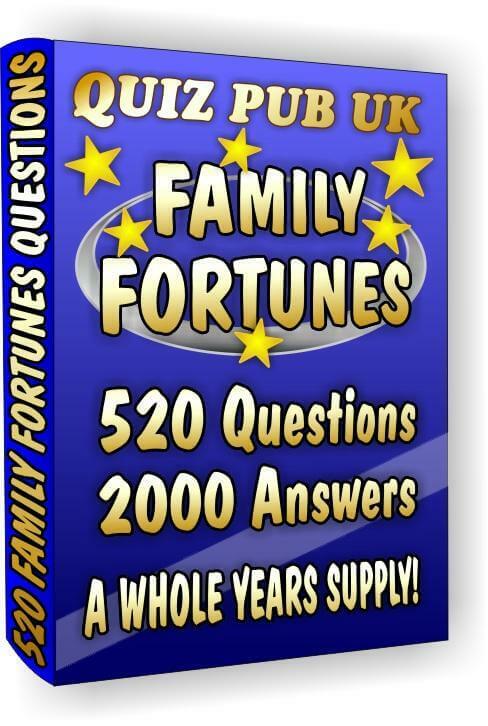 You will also find 20 free Family Fortunes questions and answers here. Beautifully made picture round handouts to add variety to your quizzes, we've even taken the trouble to remove the backgrounds to save your printer ink. Tap more to look. It wouldn't be a fun quiz without a bonus round, so we've made stunning Catchphrase picture handouts for you to add to your quiz nights. These are very popular, have a look.